This recipe publication marks my 100th blog post. I can’t believe it I made it this far. It only seemed like yesterday that I launched my blog. But my work is not done yet. There are still more recipes waiting to be published and they will be. My appetite for creativity and sharing my culinary insights (I meant to say that loosely) increases everyday. Its all about making the time,effort, and commitment (I admit that I’ve been slacking a bit). If I may digress for a moment, this post is not about celebrating my publication.There is always another time for champagne. Guessing from the title of this recipe, you know what’s on the menu tonight. The picture could have had you fooled. My photography skills doesn’t necessarily translate into my cooking skills. 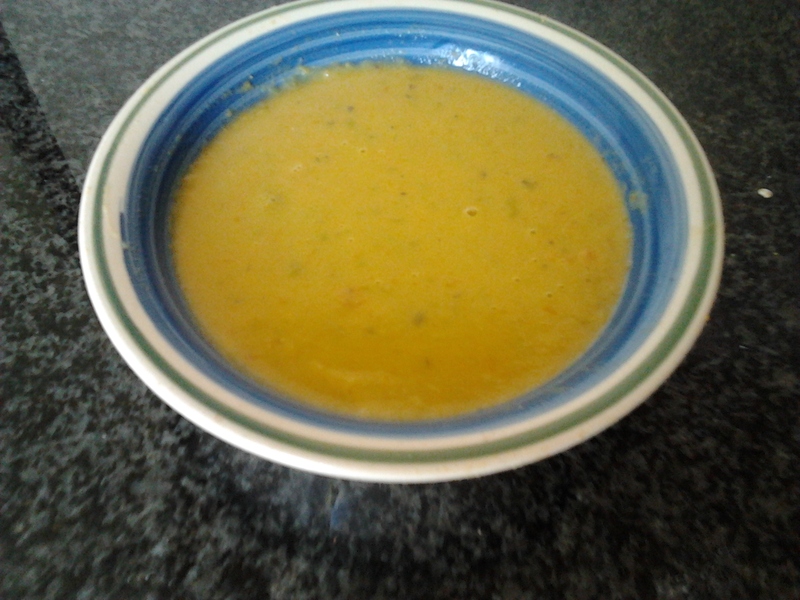 Yes the soup does contain an orange hue even though its predominately pea soup. I added some carrots to give the soup some heartiness. You can do without the carrots if you chose to. This particular soup,however, needs a roux for some thickness. For those of you who do not know what a roux is, its a combination of flour and melted butter. Its a thickening agent used of certain soups,sauces,and stews. When making a roux, the amount of butter must match with the amount of flour. This delicious,healthy, and velvety soup is make from very basic and few ingredients. I enjoy the smokey flavor that the peas add to this soup. This soup serves well with a piece of toasted bread or fish. You can add a little more roux to the leftovers and make a sauce. In a large soup pot, heat 4 tablespoons of margarine over low heat. Add flour and whisk till smooth. Cook for a minute whisking constantly until roux thickens. Add another tablespoon of margarine along with the onion and leek. Saute for 5-7 minutes or until translucent. Add in another tablespoon of margarin. Add the vegetables and the tarragon. Saute for another 5-10 minutes. Pour in the vegetable stock and bring to a boil. Reduce heat and let the soup simmer ,covered, for about 30 minutes. Puree the soup using a hand blender or in a food processor. If the soup is too thick for your liking, you can pour in a little more broth or milk. If you are not crazy about eating pea shells, you can pour the soup through a strainer to separate the shells from the soup. Season with salt and pepper if necessary. This entry was posted in Soup, Vegetarian and tagged carrots, leeks, onion, peas, roux, soup, tarragon. This corn muffin recipe was adapted from a corn bread recipe I came across a while ago. I fancied the idea of using jalapeno pepper for the corn bread. I liked the heat that it added to this loaf.For a more child-friendly version, you can leave out this pepper. I gnerally use the smallest pepper I can find. 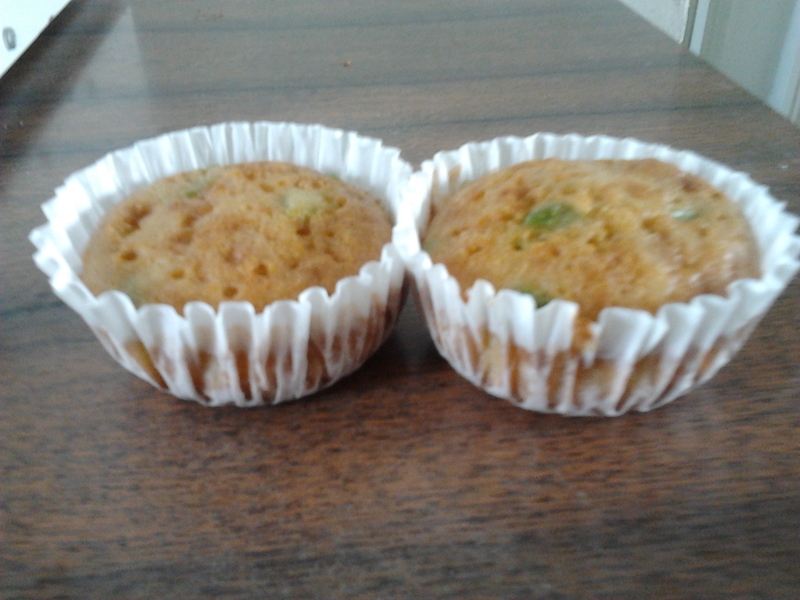 As I reiterated on a previous blog, cakes and loafs can be easily converted to muffins. I made no exception this round. When it came to corn recipes, I always felt it needed some spice to uplift the corn flavor, especially in puddings,loafs,and muffins. That’s why I always use nutmeg. These muffins can eaten as a snack,dessert or as a breakfast. They even go well with any Mexican themed dish such as Chili. Preheat your oven to 350 degrees F. In a large bowl, combine all the dry ingredients. In a separate bowl, mix all the wet ingredients except for corn and jalapeno pepper. Pour wet ingredients into the dry ingredients and mix until incorporated. Fold in corn and jalapeno pepper. Put paper muffin liners in a muffin tin, fill 3/4 full with corn bread batter and bake for 20 minutes or until toothpick comes out clean. This entry was posted in Breakfast, Desserts and tagged corn meal, eggs, Flour, jalapeño, muffins, nutmeg, salt, sugar. If you enjoyed my cranberry-apple crisp, then you are gonna love this recipe. This dessert requires mixed berries,frozen or fresh. Mixed berries are hard to come across where I live. Raspberries are unheard of so I make due with what I have. I used frozen strawberries,blueberries, and cherries. You can add blackberries if you have. Adding pears to these assorted berries gives this cobbler some substance. This dessert is not only delicious but it is healthy as well. Serve this hot accompanied with a scoop of vanilla ice cream and garnish with a fresh mint leaf (which I didn’t think to do at that moment. Oh well). Using basic ingredients, this dessert is very simple to prepare. I, however, must note that I did incorporate grounded walnuts in my flour mixture. If you have a nut allergy, you can use oatmeal or just leave out the nuts altogether but I particularly enjoy that extra crunch the nuts give to the cobbler. If you have whole walnuts in hand, just pulverize them in a food processor. Preheat oven to 350 degrees F. Grease a 9 inch baking dish. In a bowl of a mixer, combine flour,oil,sugar,walnuts, and cinnamon. Beat until mixture resembles coarse meal. Divide crumb mixture in 2. Spread the first batch all over the bottom of the pan. In another bowl, combine mixed berries and pears. Sprinkle with a dash of sugar and lemon juice and lightly toss. Pour berry mixture into the pan and spread evenly. 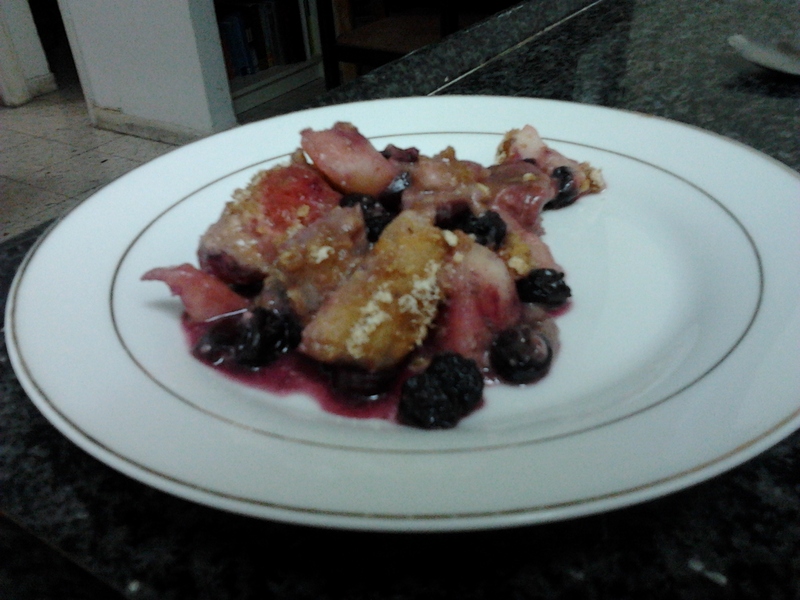 Sprinkle the remaining crumb mixture on top of the berry mixture. Bake for 35-40 minutes uncovered. Serve. This entry was posted in Desserts and tagged brown sugar, cinnamon, cobbler, grounded walnuts, mixed berries, pears, whole wheat flour. 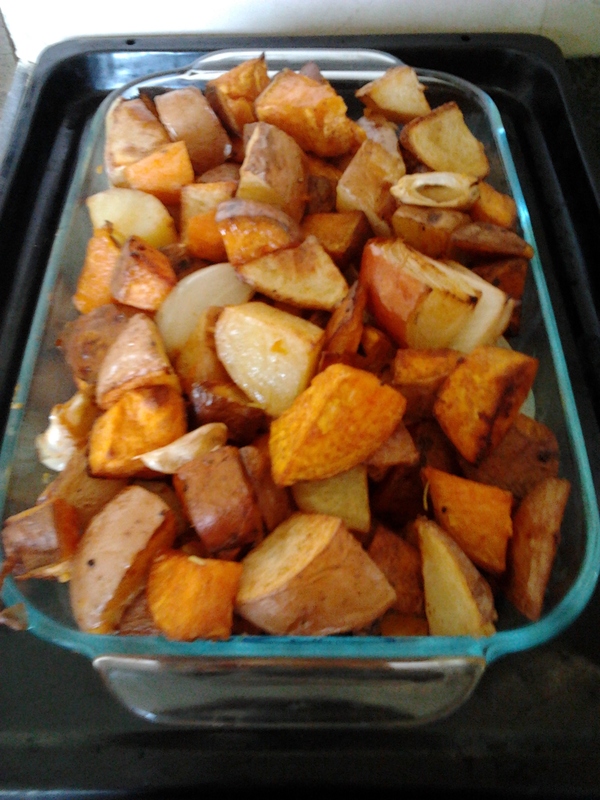 The sweet and smokey flavor of these potatoes is very tantalizing to the taste buds. Add a little spice for that extra heat. With very few ingredients, amateurs can’t go wrong with this recipe. This side dish is a healthy alternative to french fries. These roasted potatoes make a great accompaniment with my BBQ chicken (a recipe to be published along with a barbeque sauce in the very near future). If you can’t beat the heat, a good barbeque will do the trick! Prior to roasting potatoes, its important to wash the skin very well. Preheat your oven to 400 degrees. In a bowl, combined potatoes,onion,and garlic. Season with spices and drizzle with oil. Toss well till completely coated. Transfer potato mixture to a roasting pan and roast for an hour or until potatoes are golden brown and tender in the middle. This entry was posted in Gluten Free, Side Dishes, Vegetarian and tagged Garlic, olive oil, onion, red potatoes, rosemary, sweet potatoes. This post is long overdue. When I partook in a cooking contest 8 years ago, I came up with the idea of reversed baked ziti. Rather than using cheese, I used ground meat. I submitted this recipe with high hopes that the judges would appreciate the originality of this recipe. Although it sadly didn’t make it to the semi-finals, my family gave my dish 3 michelin stars. Most baked zitis are traditionally made with cheese and ground beef. As delicious as it sounds (and probably tastes), the mixing of dairy and meat are verboten in my religious circles. I used soy cream cheese to add some creaminess to the dish. 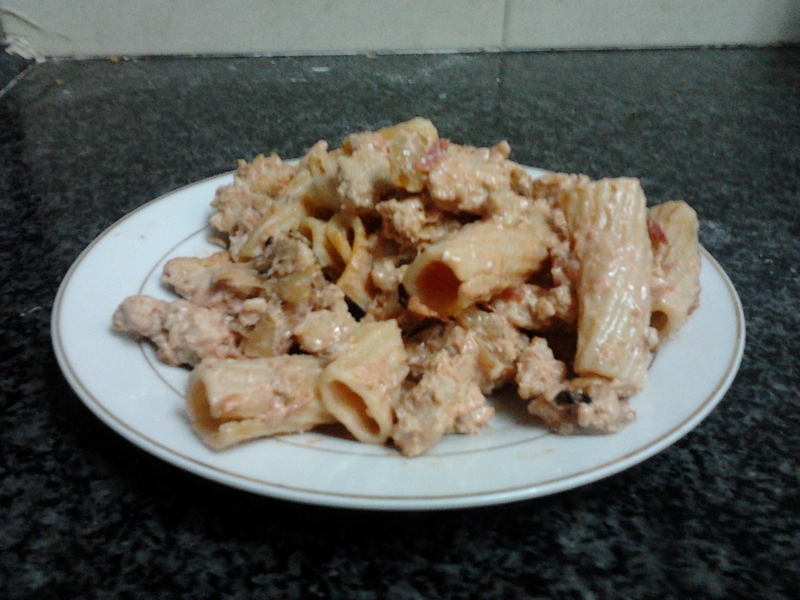 I also used a can of crushed tomatoes to reduce the sodium content. If you are not hot for soy cream cheese, you can use other non dairy options as well such as sour cream. Casserole is hard to go wrong. Preheat your oven to 350 degrees F. Cook rigatoni according to the box instructions but reduce cooking time by 2 minutes. Rinse and drain. Set aside. In a large skillet over medium high heat, drizzle pan with olive oil. Add onions and saute till translucent. Remove onions from pan and add ground meat. Cook meat for about 10 minutes or until no longer pink. Turn off stove. In a large bowl, combine crushed tomatoes with cream cheese and whisk till there is no lumps. Add the pasta,onions,and meat. Mix well till incorporated. Transfer to a 9 inch baking dish and bake covered for 45 minutes. Remove cover and bake for another 15 minutes. Sprinkle with fresh basil on top and serve. This entry was posted in Meat and tagged basil, casserole, Cream cheese, crushed tomatoes, ground meat, rigatoni, soy, turkey, whole wheat. I very seldom serve cod because its expensive. There was a killer sale on frozen cod fillets that I couldn’t pass up on. It was only a matter of finding the right flavors to make it with. There are a variety of cod recipes that I could have chosen from but since we’ve hit lime season, what better condiment could go better with cod other than freshly squeezed lime juice and a touch of lime zest? If you don’t have fresh limes on hand, you can use the bottled lime juice instead. The coarse black pepper is a beautiful to this white fish. I used crushed garlic and ginger for that extra pizazz. This fish serves well with rice or fresh salad. Preheat oven to 425 degrees F. Spray a 9 x 13-inch pan with non-stick cooking spray. Rinse cod and pat dry. Place in prepared pan. Sprinkle with salt and pepper. Drizzle with olive oil. In a small bowl, whisk lime juice with ginger and garlic. Pour mixture over fillets. Bake uncovered for 20 minutes. 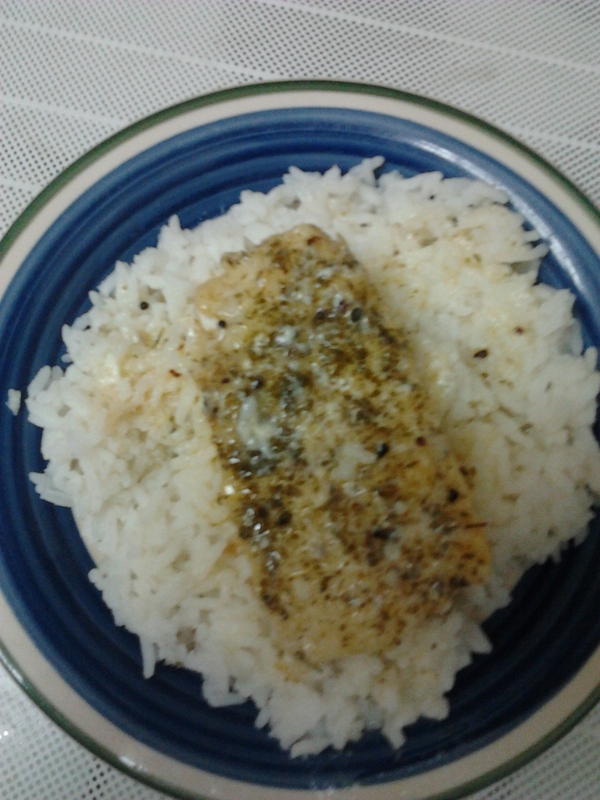 This entry was posted in Fish, Gluten Free and tagged Cod, Fish, Garlic, ginger, lime juice, rice, Salad. Cinnamon buns, or cinnamon rolls, consists of yeast,flour,butter,cinnamon, and sugar. These buns are a popular dessert in America. When I first introduced the concept of cinnamon buns, I got many curious and even confused looks. What befuddled me the most is that the cinnamon buns didn’t seem to have much of an appeal on the kiddies. Never in my 20 something odd years did I ever witness little children rejecting a sweet confection. The eggs,sugar, and margarine gives these rolls a rich and tender flavor. While most cinnamon buns require milk, I used orange juice for a non dairy version. I normally don’t use icing for these buns but since we were going to visit friends, I had to make these cinnamon fluffy delights more presentable. I even include a recipe for icing but you can skip over that if you choose to. Aside for cinnamon and sugar, some people like to add raisins and/or nuts but since cinnamon is the highlight of this dessert, I didn’t want to use other ingredients that may overlap the flavor. Plus a lot of people aren’t too enthusiastic about incorporating raisins in there desserts. If you are one of those nuts/raisins enthusiasts, don’t allow me to discourage you. Although cinnamon buns are eaten as a dessert, some people like to have them with their coffee for their breakfast (I know its not a particular healthy meal but is your scale going to castigate you for just this once?). Dissolve the yeast in warm juice and set aside for 5 minutes until foamy. Combine sugar, spread, eggs and salt. Stir in flour and yeast mixture. Turn the dough out onto a lightly floured board and knead until smooth. Sprinkle lightly with flour, as needed, to keep dough from sticking (dough should be slightly sticky). Add as little flour as possible; the more flour that is added, the heavier the bread will be, and the goal is to have very light bread, so if the dough is sticking rub a little oil on your hands. Place in a lightly greased bowl and turn once to grease top. Cover, let rise in a warm place free from draft about one hour or until dough has nearly doubled in size. Punch down, and roll the dough on a clean surface lightly dusted with flour. Roll out to a rectangle shape until it is approximately 21 inches long and 16 inches wide by 1/4″ thick. If dough begins to resist, stop working and allow it to rest for 15 minutes. Preheat oven to 400°F. While oven is preheating, mix ingredients for filling. Mix brown sugar, cinnamon, and oil in a small bowl till dissolved. Roll dough out on a floured surface into a 12 inch rectangle. Spread cinnamon mixture evenly on the dough. Starting from the long side, begin rolling the dough down to the bottom edge, jelly roll style. Cut the rolled dough into 1 3/4″ slices and place into a lightly greased baking pan, allowing about 1 inch space between each. Put the rolls into a warm place and allow to rise again until nearly double in size (approximately 30 minutes). Bake for 10 to 15 minutes or until lightly golden. In a bowl, whisk powdered sugar and water. If too thick, add a bit more water. If too thin, add a bit more powder. 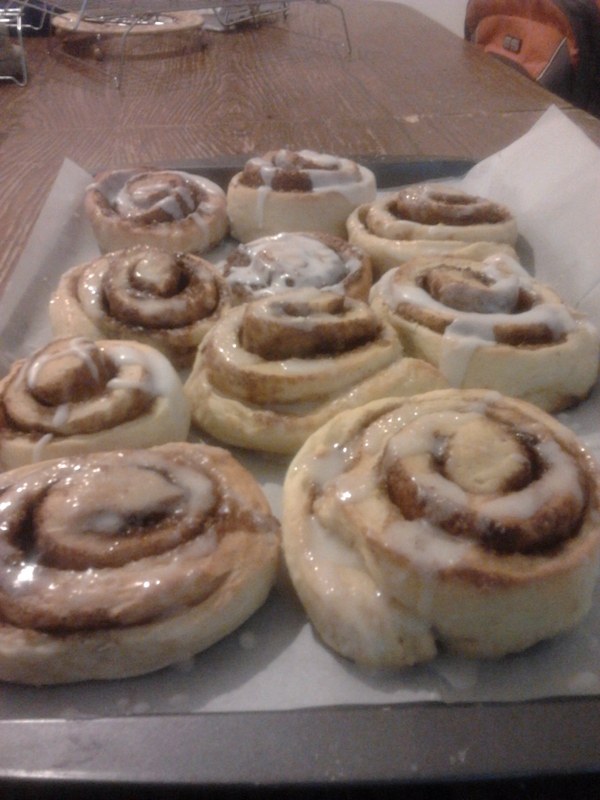 Drizzle over cooled cinnamon buns. This entry was posted in Desserts and tagged breakfast, cinnamon, cinnamon buns, dessert, filling, Flour, rolls, sugar, yeast.